Background: Bioengineering has come of ages by setting up spare parts manufacturing units to be used in human body such as invasive implants and interventional controlled drug delivery in vivo systems. As a matter of fact patients on basis of their fiscal strength have the option to undergo prophylactic tactical manoeuvre for longer life spans. In this sphere of invasive implants, biocompatible polymer implants are a state of the art cutting edge technology with outstanding innovations leading to number of very successful start-up companies with a plethora of patent portfolios. Objective: From 2000 onwards, patent filings and grants for biocompatible polymers are expanding. Currently definition of biocompatibility is quite ambiguous with respect to the use of FDA approved polymeric materials. This article analysed patent portfolios for the trend patterns of prolific biocompatible polymers for capitalization and commercialization in the forthcoming years. Method: Pair Bulk Data (PBD) portal was used to mine patent portfolios. 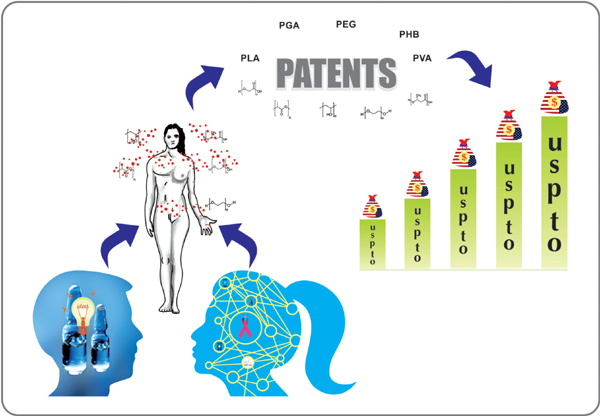 In this patent preliminary analysis report, patents from 2000 to 2015 were evaluated using 317(c) filings, grants and classifications data for poly(vinyl alcohol) (PVA), poly(glycolic acid) (PGA), poly(hydroxyalkanoates) (PHAs) and poly(lactic acid) (PLA). Conclusion: This patent portfolio preliminary analysis embarks into patent analysis for New Product Development (NPD) for corporate R&D investment managerial decisions and on government advocacy for federal funding which is decisive for developmental advances. An in-depth patent portfolio investigation with return of investment (RoI) is in the pipeline. Biocompatible polymers, bulkpat, cooperative patent classification (CPC), pair bulk data (PBD), patent analysis, thepa inc.